The dam remained until 1997 when it was slowly removed as part of a negotiation for the relicensing of Tippy Dam by The Federal Energy Regulatory Commission. Dam removal was completed in 2003. Since removal of the dam the stream channel is forming again, gravel substrate is increasing in quantity and size, and fish populations are spreading in the river. 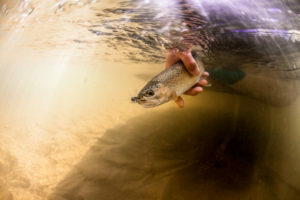 Fish populations, especially brown and rainbow trout have increased by more than 250%. 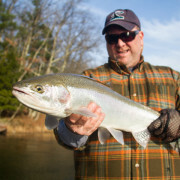 more rainbow trout than any other river in Lower Michigan. Many speculate that these rainbows are ancestors of steelhead that were trapped in the river when it was dammed in 1918. True or not they are the hardest fighting, wild rainbows you will find in Michigan. 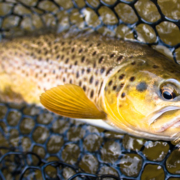 In addition to rainbows the Pine River has a large and healthy population of big brown trout. Finally, it boasts great brook trout fishing too. Again, the Pine River shows her unique side. While all the major Mayflies and caddis flies are present this is not really a “bug” fishing river. Let me step back for a minute and give you the Hawkins Outfitters perspective on the Pine River. 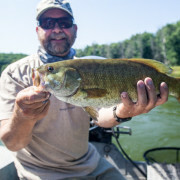 One of our guides, Ed McCoy, prior to becoming a guide received his undergraduate degree from MSU in zoology and fish biology. After graduation and beginning to pursue his graduate degree, Ed worked with Dr. Bryan Burroughs on a multi-year study on the effects of dam removal. Ed spent countless hours electroshocking the river, studying stomach contents and recording fish movement. 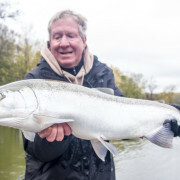 On top of Ed’s knowledge another Hawkins Guide Jeff Topp has been fishing the Pine with clients for almost 20 years, much longer than any other guide in existence. The experience of these two has been shared with every Hawkins Guide. With this knowledge we have created Pine specific patterns to appeal to fish in this unique situation. In addition to baitfish the Pine has large populations of the Pteronarcys stonefly. This bug is a size 2 to 6 providing a big meal to hungry trout. Best imitated by dead drifting Pat Rubber Leg’s or by twitching a MI Skunk. 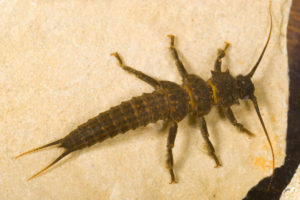 Pteronarcys nymph, major food source for Pine River Trout. 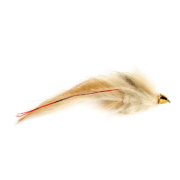 In future posts I will reveal some of the specific patterns that Hawkins Outfitters Guides have created to get bitten on the Pine River. The Pine is not open year round like many of our rivers. It opens the last Saturday in April and closes September 30 each year. The Pine is not an ideal “opening day” river most years. Due to it’s propensity to get dark easily by runoff and the fact that it is so cold. We usually wait until it cleans up from the runoff and begins to warm, usually mid-May most years. Because the Pine is so cold it is an ideal river to fish in the “dog days” of summer, July and August. By then the river temperature is in the high 50’s or low 60’s. This is when The Pine really shines. When many of our trout streams are in the high 60’s to low 70’s the Pine is still cold! The river is trout heaven! During July/August the Pine needs to be fished early or late in the day and never on weekends to avoid canoe/kayak traffic. By following these rules you can avoid the worst of the canoe traffic. The Pine River is as close to a western stream as we have in Michigan. 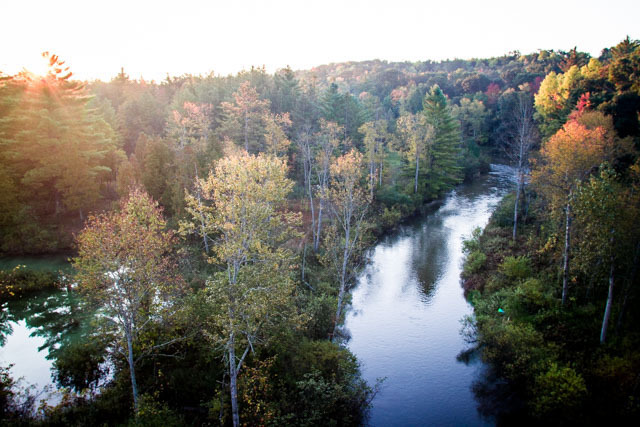 The cold, clear water, the steep gradient, the lack of structures on the lower stretch all combine to make the Pine a bucket list river for all Michigan fly anglers. 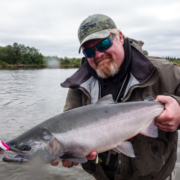 Hawkins Outfitters is one of only two guide services permitted to float the Pine River. The number of clients we can float down the river is strictly limited by the USFS. That coupled with our catch and release, flies only policy helps to maintain this unique and very valuable fishery. 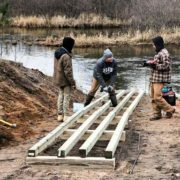 Come join Hawkins Outfitters on the most unique river in the lower peninsula.